Our clients from Sunninghill, David and Gayle, approached us after finding us on a Google search as they were looking to remodel their kitchen and improve the space by taking out a dividing wall connecting the dining room as well as to enlarge the entrance to the hallway to create an open plan kitchen and living space. David and Gayle had been to several showrooms but had not found a company that had fully realised their vision – until of course, they visited our showroom in Chertsey and immediately found what they were looking for - our concrete and platinum grey kitchen display with Dekton Kairos worktops – it was exactly what was needed to realise their kitchen vision. 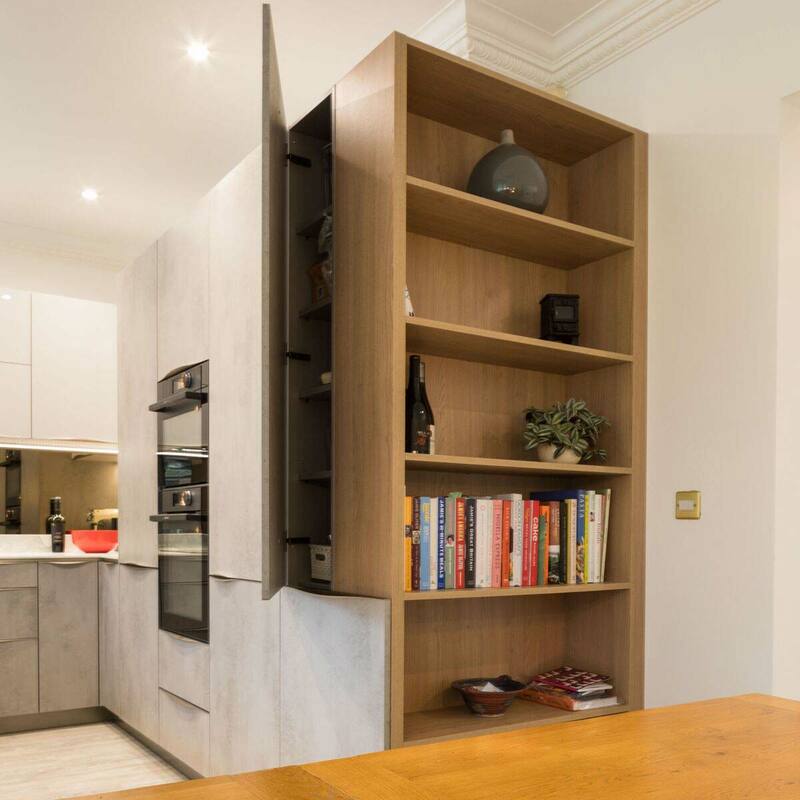 We developed a design that connected the dining area with a custom bookshelf that is integrated into the end of the tall unit run. 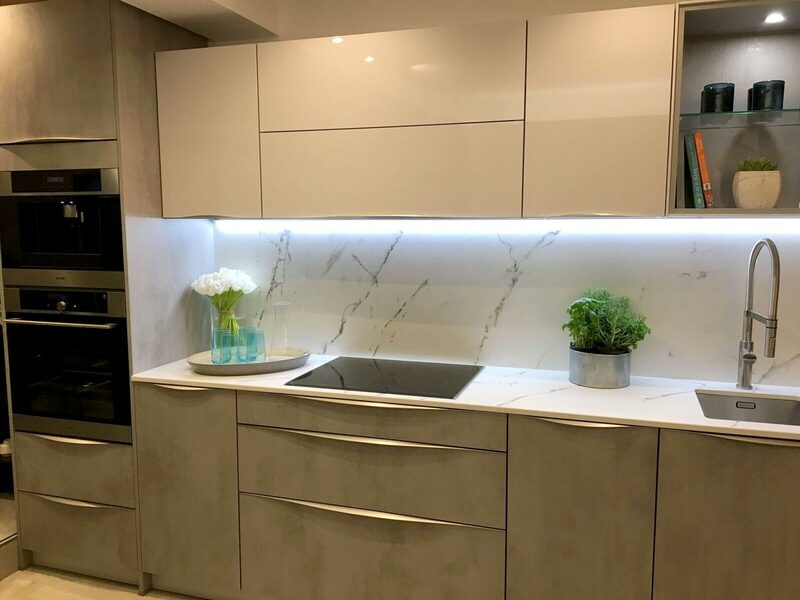 The chosen worktops were Neolith Statuario in 12mm for a sleeker look and we added a slab end to the floor and extended the worktop into the window reveal. Another feature the clients loved was a bronze mirror they had seen from another installation and so we incorporated one in their own kitchen, the bronze of the glass reflected the tone of the oak bookshelf and worked beautifully to compliment their existing oak furniture and industrial style pendant lighting. 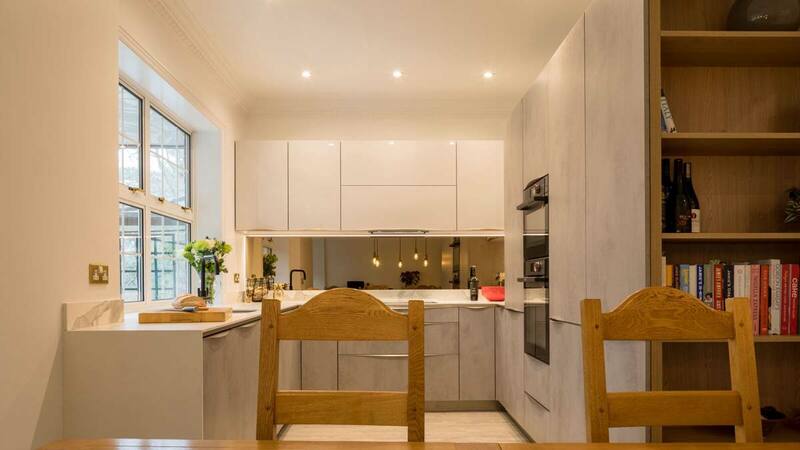 Our showrooms are a considerable investment for a local, independent, kitchen design company like ours, but vitally important to showcase just a small selection of the quality kitchens we design and install and we’re delighted when clients find exactly what they are looking for when they come in to see us.